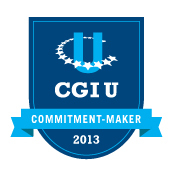 Green Grid Radio made a commitment to tackle environmental and energy education in November, 2012 for the Clinton Global Initiative University. This page will describe not only the commitment that was made initially, but will track the progress of how we’ve done. 1. Summary of your CGI U Commitment to Action. The Green Grid Radio Initiative seeks to provide thought-provoking, educational, timely content about sustainable energy systems to listeners on a weekly basis. The goal is to catalyze citizens to vote in an informed manner, develop their own grassroots movements, seek out additional educational opportunities on energy and environmental subjects that pique their interests. By discussing real problems in candid interviews with academics, policymakers, and industry representatives, the Green Grid Radio Initiative effectively addresses the education and environmental/climate change focus areas of the Clinton Global Initiative. 2. CGI U students work to address specific global challenges. What is the problem or issue you are working to address? Our Initiative tackles problems in the focus areas of education and environment/climate change. There is a severe problem with the dissemination of scientific and factual information to the public, especially in these fields… We serve to communicate truthful and technical information about these technologies in an engaging manner to an information-inundated public (and serve educational/environmental GCI areas). 3. What activities will you/your group (and, if appropriate, your partners) undertake to address this issue? I have assembled a Green Grid Radio volunteer staff of like-minded, passionate environmentalists and activists. We produce a quality program week in and week out , yet there is tremendous room for growth and improvement. I would love to see our organization recruit a larger army of volunteers who are excited about the Initiative, so that I can spend more time teaching teammates how to produce a high-level program… We will ramp up this effort during the month of January. 4. How is this different from what you have done before? The program is already novel and new because there exists a significant lack of energy/environmental discussion in traditional radio media. Our local audience covers the majority of the San Francisco Bay Area, perhaps a highly educated group. But as the 2012 presidential election debates demonstrated, these topics often fall through the cracks in regular discourse, possibly due to the long-term nature of the climate change problem. But we cannot only think about our local listeners. One of the benefits of podcasting the show is that we can reach an international audience through the benefits of the free, transparent, accessible Internet. We can therefore imagine our educational reach has significant potential. 5. How will you know you are successful? Our specific, tangible goal is to reach 1000 subscribers to our podcast by September of 2013. We believe that if our program is relevant to 1000 people, we will be engaging with a sizeable international audience to think about and strongly consider the advantages of renewable energy systems as a means to combating climate change. It will not be easy—we will need to expand our volunteer staff expectations significantly—but the benefits of greater awareness will be a reward in itself. We’ve put together some graphs, based on some tracking of our podcast and online presence over the last 6 months. Figure 1. Daily subscribers, or how many times the feed has been requested on average in a 24-hr period. Figure 2. Daily “raw hits” plotted over time, by google feedburner highlighting website traffic growth (a “raw hit” is when someone loads a page that can access a download). Figure 3. Weekly twitter “follower” counts plotted over time, highlighting growth. Unfortunately we don’t have subscriber data right now (we are working on migrating our audio to one centralized source, so we can monitor this more accurately– right now we have our audio at different sites and it is hard to track). More info soon, but we certainly have a long way to go. Please help us reach our commitment by sharing or getting involved! Categories: CGIU Commitment | Permalink.